Based just outside the pretty seaside town of Ballycastle. The aim of the farm is to create great food, sustainably. The farm is a mix of arable, grazing and rough hill ground, with it’s own stream, pond, clusters of mature trees and maintained hedgerows. It’s here that the Cole family are creating their very own good-life! Alongside an artisan butchery, eco-farm house and small farm yard, there is also a well stocked farm shop, full of Broughgammon fresh meat, local produce, garden veg and country crafts. The farm also hosts a number of Artisan masterclasses, butchery classes and seasonal courses throughout the year. 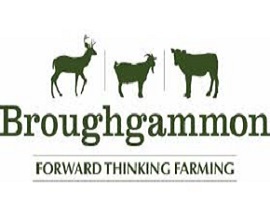 Broughgammon is a forward-thinking family run farm. Kid goat meat, free range rose veal & seasonal wild game. Highly Commended in ‘Taste of Northern Ireland’ Northern Ireland Tourism Awards 2014, Business in the Community Environmental Improvement Award 2014, ‘Local NI Food Producer of the Year’ Countryside Alliance Awards 2013, UK Countryside Alliance Awards Finalists 2013, Great Taste Award 2015, Best Snack in the British Street Food Awards. Broughgammon Farm supply meat boxes throughout the UK & Ireland via their website www.broughgammon.com. They also attend regular markets throughout Northern Ireland and Ireland. See their website broughgammon.com for more details. Wedding and events catering is available also.